In a skillet over medium-high heat, cook and crumble the sausage until nicely browned. Set aside. Place 6 cups of water in large kettle or saucepan. Place over high heat and bring the water to a boil. In a large bowl, combine the cornmeal, salt and 2 cups of water. Stir until well blended and no longer lumpy. Carefully and slowly, stream the cornmeal mixture into the boiling water. Reduce heat to simmer and cook for 10 minutes - stirring constantly. Important: Use a long wooden spoon for this. The mixture will burp and pop as it cooks. Turn off the heat and stir in the crumbled sausage. Transfer mixture to a greased loaf pan. Refrigerate overnight. Turn the loaf out onto a cutting board and slice it into pieces about 3/4 inch thick. Place a skillet over medium-high heat. 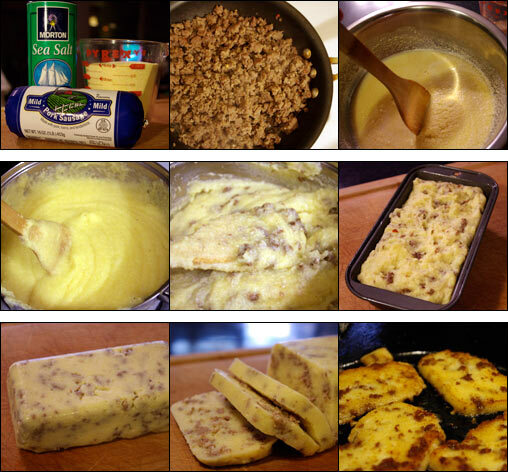 Melt 2 Tablespoon of butter. Fry the slices until golden brown on both sides (about 6 minutes for the first side and 5 minutes for the other side). Transfer cooked scrapple to stacked paper towels to remove excess grease. Add more butter as need to fry more batches. 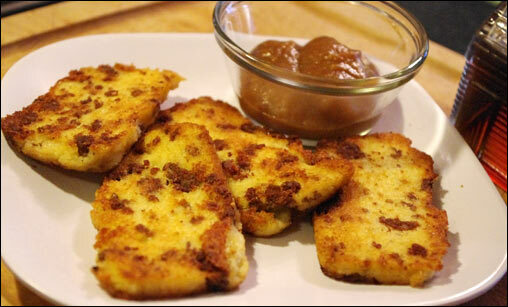 To serve, place 3 or 4 slices on each serving plate and serve with apple butter or apple sauce. This dish really shines when served with apple butter or apple sauce. The combination of savory and sweet is what makes it taste especially good. Recipe number 2866. Submitted 6/25/2010.